A plaque was unveiled at the tree on the 8th May 1953 by the 24th Battalion in memory of fallen comrades who served in World War One. 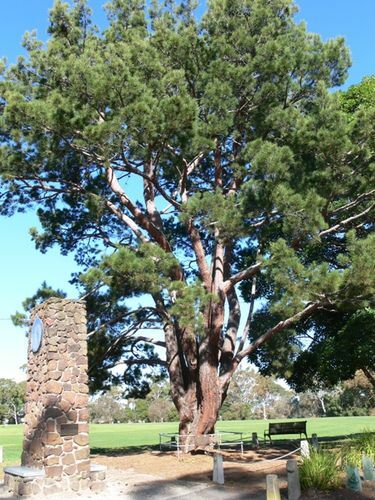 The Lone Pine was rededicated in 1995 in the presence of the 24th and the 2nd / 24th Associations and the ashes of Sir Frank Selleck of the 24th Battallion 1st A.I.F were consecrated. After the Battle of Lone Pine in 1915 a private of the 24th Battalion (AIF ) gathered three small pine cones. He brought them to Australia. They were planted several years later and produced three healthy trees. One of the trees has been presented to the 24th Battalion of the Australian Militia Forces, and it will be planted officially at Wattle Park on Sunday, May 7, by the mayors of Camberwell and Box Hill. The occasion will be the annual trooping of the colour by the 24th Battalion (Kooyong Regiment), under the command of Lieut.-Colonel Savige. About 200 former members of the 24th Battalion, A.I.F., will parade with the unit. Argus (Melbourne), 22 April 1933. "This Lone Pine was re-dedicated and the ashes of the late Sir Frank Selleck, 24th. Battallion 1st. AIF (scattered here 10.10.1976) were consecrated in the presence of the 24 (AIF) and 2/24 Australian Infantry Battalion Associations.